Now the excitement has started! CiCiBlue is running great and she's happy. Passing trucks on steep inclines and powering right along. The poor girl has been sick for so long but now she's purring. We have stayed in some nice places, even the Pilot service center for a night. You have to look at the adventure in every moment. The mountains we have gone across are small in comparison to the Colorado mountains but after so many years in Florida, a small hill seems huge. One of our stops was at Dixie Caverns in Salem,Va. I am somewhat claustrophobic so I was, of course,wary of going in to a cave! The staircase was "treacherous" so I stayed close to the wall and the beauty of it all was so amazing..I was so happy I did it. We drove about 277 miles to Melton Hill Dam to meet up with our friends Betty and Bob. Our plan was to stay two nights to unwind and chit chat. Oh ya, and laundry. It's piling up! The campground is a TVA campground or Corp of Army Engineers. It's built on three tiers and we were on the first. To get there was a good incline and thankfully now with her new turbo, we did it no problems. We did have to unhook our dolly and remove our car both at Dixie Caverns and at Melton Hill Dam. But...I am now a pro! Ok, I almost slid out of the car yesterday in Tennessee putting it on but I got it first try! Off we went through the mountains of Tennessee. Bob and Betty followed us because we thought we'd be so slow we would loose them. With our new turbo and exhaust I guess we were loosing them behind us as we zoomed up hills. (Doing happy dance wildly here!!) As I'm trying to get this blog finished, Roger just came in and told me we have a leak from our hydro hot system. Not a major thing compared to what we just went through but we are loosing water. The up side to all of this is this campground has an RV repair service right here on site!! BONUS!! I just walked down, (the rest of the world, except Florida, has been created on hills), to the office to see if we could get a repair man up to see us. Depending on what needs to be done we may or no be leaving here today. (Secretly I love it here). 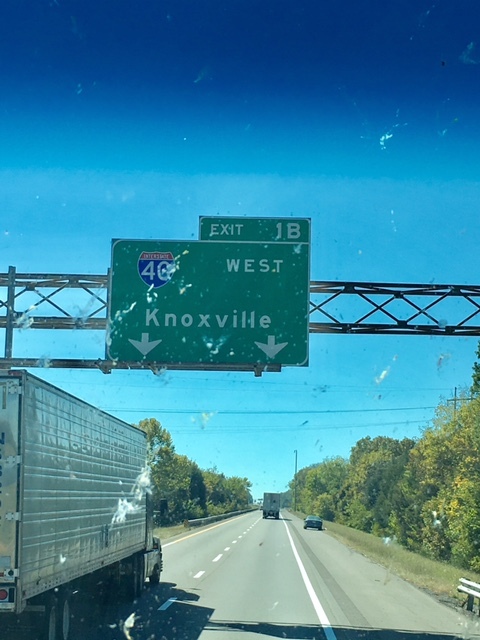 Thankfully my desire to see beyond Tennessee is strong!! This was part of the 5% down hill grade that went for miles. Now being in the fishbowl of CiCiBlue it was enjoyable, even the twists and turns. Can you believe I just said that? Haha. The entrance to Parkers Crossing Campground. Right now we are having some breakfast and waiting for the repair man to appear. Hopefully he can do a fix and get us on the road by 10: A.M., but we will see. All part of the adventure..and..I'm loving it!!! When we stay two nights I get to work on commissions. This is an 8" x 6" oil on museum quality panel.There is a companion piece to follow. Our next stop will be a two night stay! Woohoo. So there it is..the recent update. I'm so happy! Yes, there are days I feel like "staying put" but the "what's on the other side of the mountain" kicks in and I have to go. Repairs will happen but we are living the dream.! (Sometimes that is said with clenched teeth). Hahaha! Have a great day and I'll see you next time we have internet! !